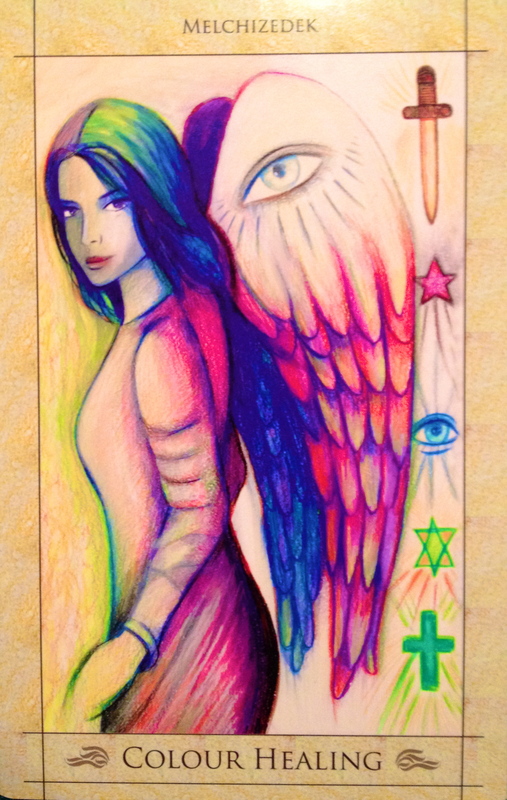 Melchizedeck ~ Colour Healing: “Our world exists in shades of light. Within that light, there is every colour of the spectrum. As that light touches the world around us, the colours are absorbed and reflected. If an object is green, it will absorb all the other colours in the spectrum and reflect green. That green frequency is then reflected onto us and our skin and eyes receive this information and we become affected by that vibration. The interesting thing is that the object itself is anything but green. This is why the green is reflected rather than absorbed and that is why we interact with it. Colour has an enormous part to play in our lives. In our clothes, homes and work environments, it is a dominant part of the vibrational information we receive. Being surrounded by red will bring a sense of alertness, energy, and will naturally give you a charge, whereas blue will bring a sense of calm, peace and openness. The colours that surround us in our lives have a powerful impact on our health and energy levels. Sunlight contains within it all the colours in a natural balance. This provides us with the nourishment we need for complete emotional and physical health. Our bodies can not absorb calcium without vitamin D which we absorb from the ultraviolet light present in sunlight. Artificial light contains significantly lower amounts of red and ultraviolet light and a prolonged lack of sunlight can produce depression and lower energy levels. We also require periods of complete darkness in order for the hormones we need for immunity, healing of the body and mind and general well-being, to be secreted. Light and colour have an enormous amount to do with health and well-being. This is a time for you to take note of light and colour in your life. Are you getting enough sunlight? Do you get a solid sleep in complete darkness? How do the colours in your clothing, home and workspace affect you? What is needed in order to create more healing and balance in your life right now? Colour is so important in our every day lives; yet we often take it for granted. We choose what to wear to boost our energy up or calm ourselves down, some colours make us feel more attractive than others, suite our skin and make us feel like we are radiating light.We can choose crystals that reflect the colour we are attracted to for healing energy, corresponding to our chakras, which are energy centers of light. Even the colour we paint our rooms makes a difference to how we feel when we spend time there. Take some time to meditate and ask your angels to revel their healing halo colours to you. Whatever colours springs to mind is the right one, and you can use the corresponding crystals, to open the connection. Colour is a wonderful healing tool to use when raising your vibration. Spend some time in nature, reveling in the colours that Mother Gaia has to offer you, particularly as spring unfolds.